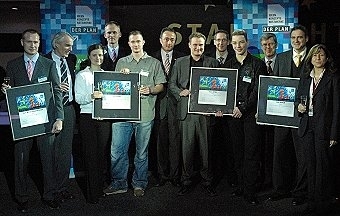 Home / News / 1st award for the business idea of the ICCAS spin-off company SPMG GmbH iG. 1st award for the business idea of the ICCAS spin-off company SPMG GmbH iG. On the 30th of January, the best business-ideas of founder and young business-men 2007 in the categories Technology, Bio-/ Nanotechnology, Information-/ Communicationtechnologies and Service were honored in Chemnitz within the business-plan competition FutureSAX. In the category Technology the ICCAS spin-off company SPMG GmbH iG SPMG won the first award. The team develops surgical simulation systems, detecting injuring of structures at risk during the simulation. Furthermore, SPMG will create patientindividual models for preoperative planning.